The Caboonbah Undenominational Church is a not for profit Incorporated Historic Church. Built in 1905, as an Undenominational Church, the organisation has a long history of being inclusive of all faiths and continues to maintain this inclusive legacy through recognition of the recent marriage laws. The building and contents are original with a beautiful natural timber interior and seating capacity for 90 persons. The church is located along an idyllic country dirt road and nestled amongst local farms with a beautiful mountain backdrop. The neighbouring farm has an olive grove adjacent to the church grounds. The Church is situated on half an acre of land, surrounded by native and Jacaranda trees. There is also a picnic shelter which is just perfect for entertaining guests with a grazing table whilst the wedding party are busy with the photographer. Our couples travel from Sydney, Melbourne and further afield for an authentic destination wedding. 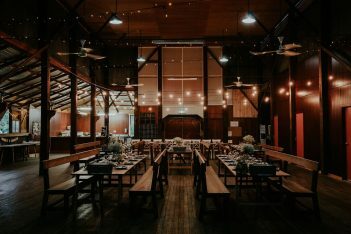 In particular, many of South-East Queensland couples have chosen Caboonbah Undenominational Church for their wedding given its convenience to Coronation Hall, Somerset Dam, Brisbane, Toowoomba, the Sunshine Coast and Gold Coast. The church is run by volunteers and as such will only host a limited number of weddings.